ELA.RF.1.1: Demonstrate understanding of the organization and basic features of print. ELA.RF.1.3: Know and apply grade-level phonics and word analysis skills in decoding words. ELA.RF.1.4: Read with sufficient accuracy and fluency to support comprehension. ELA.RF.1.1a: Recognize the distinguishing features of a sentence (e.g., first word, capitalization, ending punctuation). ELA.RF.1.3g: Recognize and read grade-appropriate irregularly spelled words. ELA.RF.1.4c: Use context to confirm or self-correct word recognition and understanding, rereading as necessary. 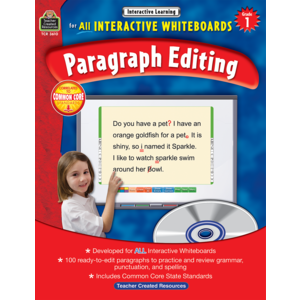 ELA.RF.1.4a: Read on-grade-level text with purpose and understanding. ELA.L.1.1b: Use common, proper, and possessive nouns. ELA.L.1.1j: Produce and expand complete simple and compound declarative, interrogative, imperative, and exclamatory sentences in response to prompts. ELA.L.1.1c: Use singular and plural nouns with matching verbs in basic sentences (e.g., He hops; We hop). ELA.L.1.1d: Use personal, possessive, and indefinite pronouns (e.g., I, me, my; they, them, their; anyone, everything). ELA.L.1.1e: Use verbs to convey a sense of past, present, and future (e.g., Yesterday I walked home; Today I walk home; Tomorrow I will walk home). ELA.L.1.2b: Use end punctuation for sentences. ELA.L.1.2a: Capitalize dates and names of people. ELA.L.1.2c: Use commas in dates and to separate single words in a series. ELA.L.1.2d: Use conventional spelling for words with common spelling patterns and for frequently occurring irregular words.